Kolkata, May 14 (IANS) Kolkata Knight Riders (KKR) co-owner and Bollywood superstar Shah Rukh Khan is backing his team to come back to the Eden Gardens with the IPL trophy. 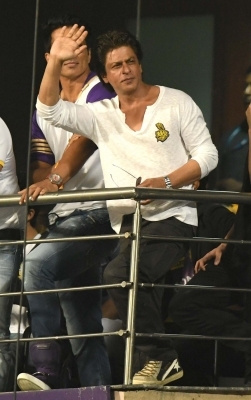 Busy with his film shooting, Shah Rukh could only attend KKR’s last home game at the Eden. KKR lost by nine runs to Mumbai Indians. “The way the crowd has supported us in every match, we will try our best to return here again — with the trophy,” Shah Rukh told reporters while leaving the Eden Gardens post-midnight after the rain-delayed tie. “We lost closely in a few matches. It’s difficult now but that’s even better. We have to win three matches now (Eliminator, Play-off and Final),” he added. 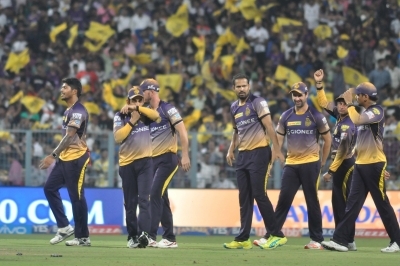 KKR will play the Eliminator on May 17 in Bengaluru. “It was the last match in Kolkata and a bit unfortunate that none of them will be here. But even if we don’t return again to play a match this season, God-willing we will come back with the trophy,” Shah Rukh said. Shah Rukh praised the home fans for their massive support. “All stadiums are good across India. But their full capacity is our half capacity. We always had full house, even when we were not doing well in earlier seasons,” he said. “The attachment from Kolkata fans is helping us moving forward. We will forever remain purple. I really wanted to tell everyone that I was busy in work and could not come earlier,” he added. Shah Rukh hoped to follow the team in the play-offs in their quest for a record third title. “I don’t give the team any message. I just hug them and wish them fitness and all the best. I’m here to give them love. We have an experienced coaching staff and senior players to guide the team. I just come to give them hug,” he signed off.